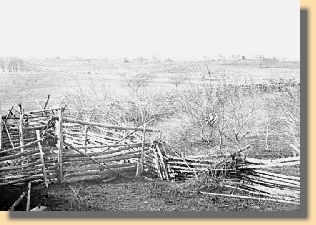 Attempting to stop the Confederate retreat, General Barnard Bee pointed to General Thomas J. Jackson at the crest of Henry Hill (7) and shouted, "There stands Jackson like a stone wall! Rally behind the Virginians!" 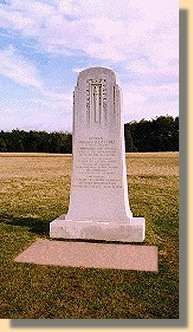 The Stonewall Jackson and General Bee Monuments at the Manassas Battlefield . General Bee, who gave Jackson the nom de guerre "Stonewall", was killed in the battle. 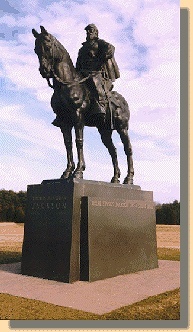 At that time Generals Johnston and Beauregard arrived at Henry Hill and helped rally the retreating brigades. They also began deploying fresh units that were coming to the front. Around noon the Federals paused their attack for about an hour in order to regroup. The Confederates took advantage of the time and reformed their lines. 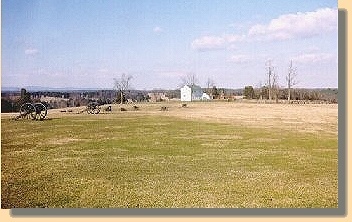 The Bull Run Battlefield in the 1860's and 1998. The house in the distance, in the 1998 photograph, is the reconstructed Judith Henry House.